Thomas Doherty was a unique individual in Lambton history. He was a man with broad interest and an inquiring mind, a poet, inventor, engineer and politician. 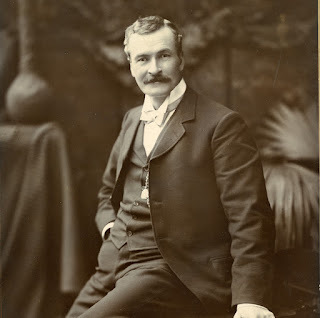 Often recognized as a Sarnia man, Doherty also had connections to other parts of Lambton County and is often celebrated as one of Lambton’s industrial pioneers. Thomas was born in Lanark County and moved to Uttoexter in Plympton Township at the age of 6. At a young age he showed an aptitude for fixing machinery and equipment, and operated a small blacksmith shop fixing farm tools. It is believed that he built his first thresher in his shop there. 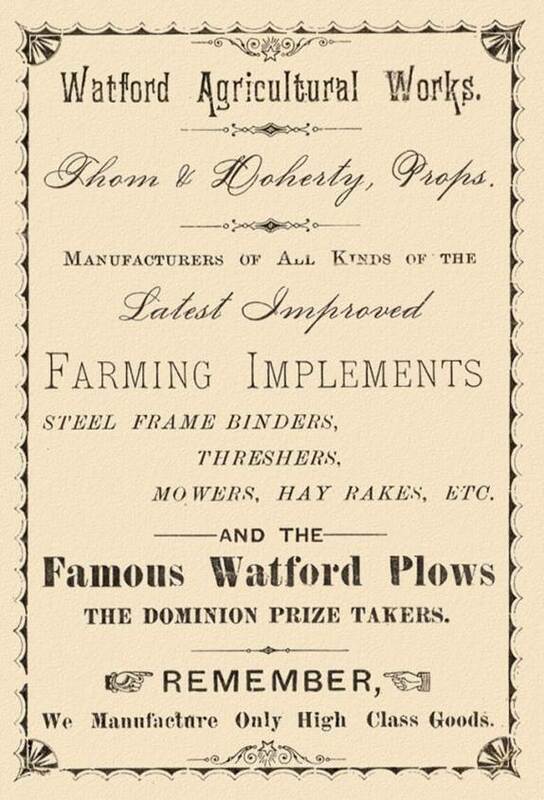 Thomas showed an early business aptitude and, keen to expand on his skills, when the Village of Watford offered free land to anyone willing to set up a foundry and machine shop he moved his family and founded Watford Agricultural Implement Works in 1875. Doherty was an excellent businessman and realized quite early that to be viable in a local market he needed to be diverse and could not focus on one line of equipment, such as threshers. 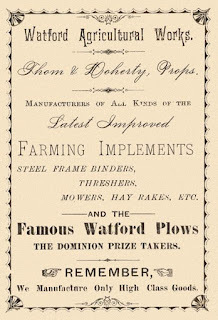 Watford Agricultural Implement Works instead offered a full line of implements, which also allowed his shop to corner the market on implement repairs. He also guaranteed his equipment would be equal to any other manufacturer and customers could return it if not satisfied after purchase. His extensive sales were based mainly on customer testimonials. 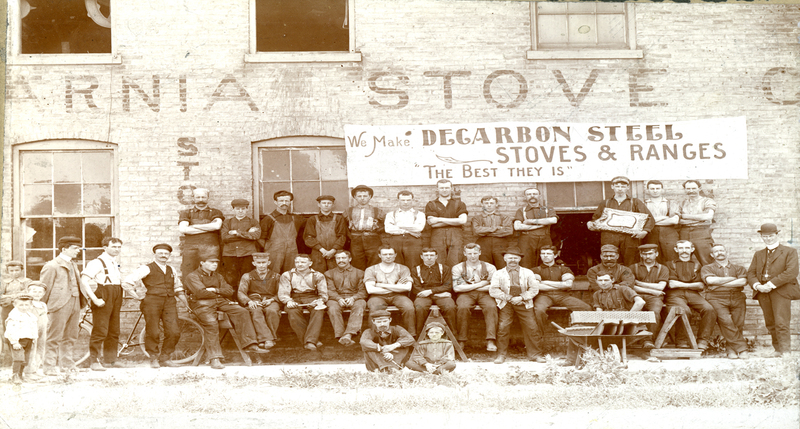 In 1881 Tom took advantage of a tax forgiveness scheme that Sarnia was offering to attract new business and opened a foundry there. The Doherty Manufacturing Company, located at the corner of Queen and Wellington Streets, focused on stove production and was soon a major Sarnia employer. By 1913 the plant had expanded to take up the entire block between Queen and Vidal Streets, churning out 3000 stoves a year. Tom was a constant tinkerer and had a naturally inquisitive mind. He held patents for many of his inventions over the years, an early one being the discovery of a method to make cast iron as strong as steel, yet more malleable and easy to work with. Called ferrous steel, he patented this method as the "Doherty Process". Through further experimentation, he developed a more refined method of controlling the impurities in iron, producing what he named "DeCarbon Steel". This steel was used in his stoves which he guaranteed would not crack or warp and would last two stoves made of regular steel. His business sense also played a large part in his success with Doherty Manufacturing - he did not employ travelling salesmen, and passed those savings directly on to the consumer. To make his stoves more attractive, he produced intricately embellished stoves, including elaborate designs, images and colour on ceramic tiles and used nickel to add flair. The stoves were all given whimsical names to evoke an emotional response in his customers. Beyond Ferrous Steel and DeCarbon Steel, Doherty held patents for many other innovations. He obtained his first patent in 1881 for "Doherty's Improvements on Thrashing Machines". With his guarantee of the "perfect separation of grain from the straw" he received $4,000 in orders at its unveiling at the Warwick Fair. In the early 1890's there was a demand for central heating in homes, businesses, and government buildings. Doherty set out to design, patent and manufacture a new, highly efficient boiler system which was awarded a gold medal by the Parisian Inventors Academy! Doherty also devised several engines. He developed a marine engine and a gasoline engine which had two pistons in one cylinder and was said to be vibration free. Thomas built Sarnia's first Automobile in 1895, largely from bicycle parts. The 3 wheeled vehicle was powered by a huge coil spring that had to be manually wound every few blocks. His next car was a 5 seater seen here, with 4 cylinders, pneumatic tires and a water cooled engine. This novelty was not well loved in town though - often seen as a nuisance and scaring horses. 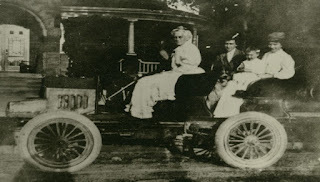 In fact, his car was banned from the Sarnia & Florence Plank Road by its private owners for spooking a horse and upsetting the carriage. This ban was even upheld in a court of law when Doherty challenged it. "Doherty's Red Touring Car Put Out of Business by a Trolley baggage Car" declared the Sarnia Observer in 1903 when Doherty's Automobile and the baggage car of the Sarnia Street Railway affectionately "kissed" each other. 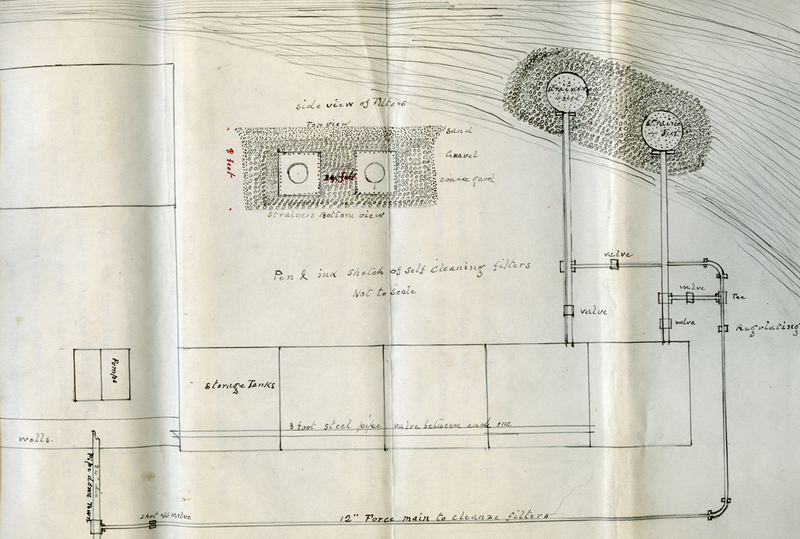 Thomas also worked with the Sarnia Waterworks to improve the safety of the town water supply. 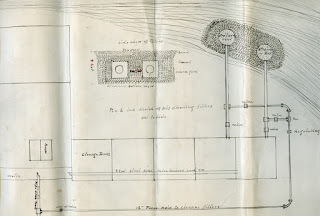 He invented and patented a new water filtration system for use in the new waterworks, which was completed after his death. Doherty did not just obtain patents in Canada for his inventions. He obtained patent rights in the United States, England, and much of Europe. His fortune was made by selling the patent rights to all his inventions around the world. Thomas was also actively involved in civic life, beginning in Uttoxeter where he was involved in the Canadian Grange Movement, to try and improve the lot of farmers across the Country. He then went on to be a councillor in Watford, an Alderman in Sarnia, chairman of the Sarnia Parks Board, a hospital trustee, and member of the Sarnia Street Railway, Board of Trade, the Industrial Club, the Sarnia Automobile Club, the Sarnia Waterworks and finally was acclaimed Mayor of Sarnia in late 1915. Doherty's time as mayor was unfortunately cut short. On September 6, 1916 he addressed the citizens of Sarnia at the laying of the cornerstone for an addition to St. Paul's Presbyterian Church. After his speech, he returned to his chair where he collapsed and died instantly of heart failure. With the death of Thomas Doherty Lambton County lost one of its earliest and greatest industrial pioneers. 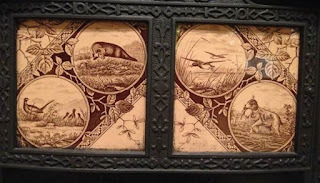 Thank you to our guest blogger Laurie Webb, Curator/Supervisor of Museums for the County of Lambton, for providing this blog on Thomas Doherty!